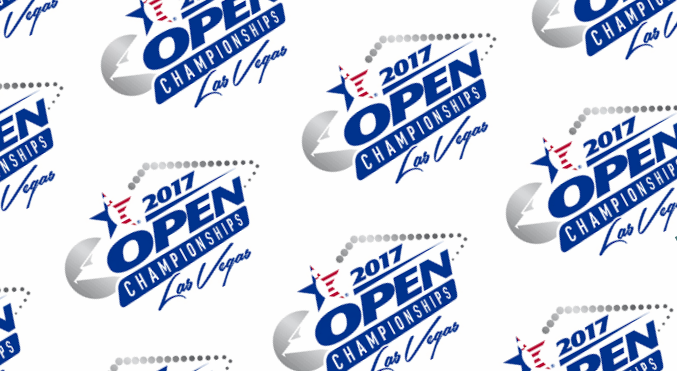 John Nolen of Waterford, Michigan, and Mike Reasoner of Hazlet, New Jersey, first met during their team practice session at the South Point Bowling Center in Las Vegas, and two days later, they found themselves at the top of the Regular Doubles standings at the 2017 United States Bowling Congress Open Championships. The two had instant chemistry on the lanes and rolled games of 500, 446 and 485 at the nearby South Point Bowling Plaza to sneak into the lead with a 1,431 total May 26. They both delivered doubles in the final frame to lift them past the father-and-son duo of Doug and Jacob Kent of Newark, New York, who previously held the lead with 1,425. Nolen set the pace with a 725 series, and Reasoner added 706. 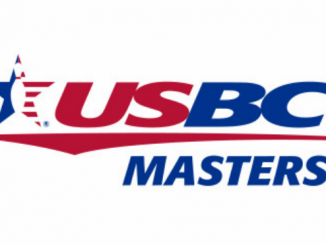 Reasoner improved with each set in just his second USBC Open Championships appearance since 2010, and sixth overall, sandwiching his doubles success between 736 in singles and 651 in team for a 2,093 all-events total, which is fourth in Regular All-Events this year. The 49-year-old right-hander’s career-best outing helped Turbo Grips 3 of Chesterfield, Michigan, into third place in Team All-Events with a 9,833 total. He was followed by Nolen, the 2009 USBC Masters champion (2,026), Jeffrey Austreng (1,926), Alan Pittman (1,903) and Chris Sand (1,885). Their companion team, Turbo Grips 4, moved into a tie for third place in Regular Team with a 3,240 performance May 25. Just weeks after finishing his freshman year at West Texas A&M, Rusty Johnston of Austin, Texas, was excited about the opportunity to compete in his first USBC Open Championships. The 19-year-old right-hander shook off the initial nerves of competing in the world’s largest annual participatory sporting event and settled in during doubles and singles May 28 on his way into the lead in Standard All-Events at the South Point Bowling Plaza with a 1,915 total. Johnston had 681 in singles, which is tied for second place in Standard Singles, and added 670 in doubles and 564 in team. Brennan Nett of Kiel, Wisconsin, previously held the lead in Standard All-Events with 1,865, while Charlie Theobald of Minot, North Dakota, leads Standard Singles with 696. Dennis Lane of Kingsport, Tennessee, and USBC Hall of Famer Bob Chamberlain Sr. of The Villages, Florida, became the latest members of the 50-Year Club at the USBC Open Championships. The two are among 23 bowlers who were scheduled to reach the 50-year plateau this year at the South Point Bowling Plaza, and they made their milestone marches to the lanes May 23 and May 25, respectively. Lane and Chamberlain both made their tournament debuts at the 1968 event in Cincinnati and have competed for 50 consecutive years. 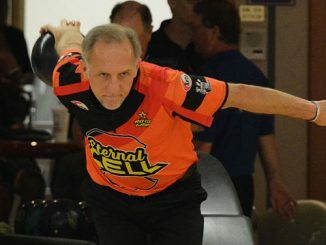 This year at the South Point Bowling Plaza, Lane, a 69-year-old right-hander, rolled sets of 655 in singles, 582 in doubles and 511 in team for a 1,748 all-events total. In 50 years on the tournament lanes, he has knocked down 92,293 pins for a career average of 204.6. Chamberlain, a 68-year-old right-hander and 1980 Regular Team champion, had 591 in doubles, 587 in singles and 562 in team for a 1,740 all-events total. In 50 years on the tournament lanes, he has knocked down 92,396 pins for a career average of 203. Lane and Chamberlain received plaques, chevrons and diamond lapel pins to commemorate their milestones. Joseph Egofske of Monee, Illinois, will be the lone bowler reaching a milestone this week at the USBC Open Championships as he celebrates 55 years of tournament participation June 3. Egofske made his first Open Championships appearance at the 1963 event in Buffalo, New York, and has competed on the championship lanes every year since. In 54 years of competition, he has knocked down 80,543 pins. 1, Team NABR (Adam Barta, Anthony Pepe, Mike Rose Jr., Scott Pohl, Brian Waliczek), Fairport, N.Y., 3,266. 2, BowlingDynamics.com, Phoenix, 3,246. 3(tie), Shot Makers Pro Shop, Temperance, Mich., and Turbo Grips 4, Chesterfield, Mich., 3,240. 5, HoF Silver Lanes 1, New Hartford, Conn., 3,239. 6, Bowlers Connection 1, Carpentersville, Ill., 3,222. 7, Kruse’s Pro Shop, Fargo, N.D., 3,198. 8, TJ’s Pro Shop, Beaver Dam, Wis., 3,191. 9, Supreme Deck, Grand Haven, Mich., 3,174. 10, StormEBIMotiv, Cincinnati, 3,168. 1, Mike Reasoner, Hazlet, N.J./John Nolen, Waterford, Mich., 1,431. 2, Jacob Kent/Doug Kent, Newark, N.Y., 1,425. 3, Timothy Pfeifer, Oakdale, Pa./Christopher Bardol, Brockport, N.Y., 1,417. 4, Ryan Zagar, Racine, Wis./Tylor Greene, Davison, Mich., 1,409. 5, Charles Richey, Concord, N.C./Steve Arehart, Chesapeake, Va., 1,385. 6, Jeff Fehr/Kenny Abner, Cincinnati, 1,385. 7, Scott Erickson, Waunakee, Wis./Chris Gibbons, Madison, Wis., 1,378. 8, Michael Kubacki Sr., Griffith, Ind./Sammy Krucek, Hammond, Ind., 1,369. 9(tie), Jonathan Schalow, Evansville, Wis./Chad Svendsen, Monroe, Wis., Chris Hans, Battleboro, N.C./Kyle Troup, Taylorsville, N.C., and Doug Hayes, Clarksville, Tenn./Jimmy Cook II, Indianapolis, 1,365. 1(tie), Matt Gasn, Clarksville, Tenn., and Steve De Kerf Jr., Sheboygan Falls, Wis., 802. 3, Adam Barta, Girard, Ohio, 776. 4(tie), Austin Gratzer, University Place, Wash., and Patrick Girard, Quebec City, 773. 6, Tommy Barnwell, Peoria Heights, Ill, 771. 7(tie), Sam Sylvester, Hugo, Minn., and Todd Lathrop, Colchester, Conn., 770. 9(tie), Chris Curry, Indianapolis, and Marc Massie, Alexandria, Ky., 769. 1, Jacob Boresch, Kenosha, Wis., 2,122. 2, Todd Lathrop, Colchester, Conn., 2,105. 3, Chris Gibbons, Madison, Wis., 2,102. 4, Mike Reasoner, Hazlet, N.J., 2,093. 5, Stuart Williams, Phoenix, 2,090. 6, Tim Pfeifer, Oakdale, Pa., 2,069. 7, Chris Bardol, Brockport, N.Y., 2,065. 8, Jeff Fehr, Cincinnati, 2,055. 9, Kenny Abner, Cincinnati, 2,054. 10, Shawn Naumann, Orlando, Fla., 2,053. 1, Team NABR (Adam Barta, Anthony Pepe, Scott Pohl, Michael Rose Jr., Brian Waliczek), Fairport, N.Y., 9,957. 2, Rose Bowl Lanes, Rochester, N.Y., 9,867. 3, Turbo Grips 3, Chesterfield, Mich., 9,833. 4, Vanilla Salsa, Roseville, Calif., 9,743. 5, BuddiesProShop.com 2, Naugatuck, Conn., 9,638. 6, Lakeview Lanes, Baldwinsville, N.Y., 9,635. 7, StormEBIMotiv, Cincinnati, 9,628. 8, Fehr Calhoun Bowlers Corral, Alexandria, Ky., 9,615. 9, High5Gear, Wichita, Kan., 9,596. 10, Maxxx Revs Pro Shop, Peoria Heights, Ill., 9,592. 1, Minnesota Select Sires 1 (Arvid Strande, Carl Krause, Paul Buendiger, Scott Molnar, Andrew Kasten), Fergus, Minn., 2,922. 2, Chris’ Boys, Livingston, Mont., 2,778. 3, C.G. Misfits, Casa Grande, Ariz., 2,771. 4, General Distributors 2, Beavercreek, Ore., 2,748. 5, Scotty’s 3, Alexandria, Minn., 2,738. 6(tie), Aztec 4, Lacey, Wash., and Invazn, Columbia, Mo., 2,729. 8, Rimmy’s Pro Shop 2, Oak Lawn, Ill., 2,709. 9, Ten Pins Pro Crew 3, Fremont, Calif., 2,697. 10(tie), Becker’s Pro Shop, Muskego, Wis., and Rowlett Bowl-A-Rama, Garland, Texas, 2,696. 1, Stuart Sheck, Germantown, Md./Robert Tonelli, Henderson, Nev., 1,236. 2, Cole Schroyer, Canyon, Texas/Brandon Simmons, Amarillo, Texas, 1,214. 3, Douglas Turney/Brennan Nett, Kiel, Wis., 1,201. 4, Kaitlyn Schroyer, Stanton, Texas/Matthew Hoffman, Richmond, Texas, 1,198. 5, Steven Costa, Chicago/Anthony Giannecchini, Hawthorn Woods, Ill., 1,197. 6, Thomas Fredrick/Mark Mallow, Watertown, Wis., 1,192. 7, Ramon Pagan/Raymond Haran, Chicago, 1,191. 8, Nicholas Frederick, Commerce, Mich./Zane Hollander, Las Vegas, 1,190. 9, Danny Smart, Shreveport, La./Jim Daubenheyer, Valparaiso, Ind., 1,188. 10, Debra Barmore, Omaha, Neb./Tim Kightlinger, West Des Moines, Iowa, 1,187. 1, Charlie Theobald, Minot, N.D., 696. 2(tie), Rusty Johnston, Austin, Texas, and Scott Williams, Aberdeen, Md., 681. 4, Nolen Fisher, Caldwell, Idaho, 677. 5, Larry Neb, Loveland, Colo., 674. 6, James King, Edmonds, Washington, 673. 7, Earl Bowe, Freeport, Bahamas, 667. 8, Brennan Nett, Kiel, Wis., 665. 9, Jonathon Berg, Bismarck, N.D., 663. 10, Mark Schenking, Uncasville, Conn., 659. 1, Rusty Johnston, Austin, Texas, 1,915. 2, Brennan Nett, Kiel, Wis., 1,865. 3, Nolen Fisher, Caldwell, Idaho, 1,829. 4, Stephanie Sanders, Bakersfield, Calif., 1,826. 5, Timothy Hagar, Celina, Ohio, 1,809. 6, Mike Thielen, Eagle Grove, Iowa, 1,801. 7, Michael Kay, Bolingbrook, Ill., 1,799. 8(tie), David Miller, Menomonie, Wis., and Stanley Chambliss, Opelousas, La., 1,795. 10, Paige Collick, Helena, Mont., 1,788. 1, Scotty’s 8 (Chad Brandt, Ryan Dew, Bruce Corneliusen, Zach Hedine, Alan Iverson), Alexandria, Minn., 2,569. 2, Dusty’s Floor Covering, Twin Valley, Minn., 2,487. 3, Spray And Pray, Los Angeles, 2,486. 4, The Misfits No. 2, Maryville, Ill., 2,471. 5, Brant Construction, Spirit Lake, Iowa, 2,462. 6, WA Bowlers 7, Renton, Wash., 2,459. 7, Kutztown Fire 1, Kutztown, Pa., 2,456. 8, Decorah Auto Center, Calmar, Iowa, 2,437. 9, Wags N Whiskers, Livingston, Mont., 2,436. 10, TNBA OSNM 1, South Holland, Ill., 2,426. 1, Ashley Olriksen, Brooklyn Park, Minn./Bud Olriksen, Las Vegas, 1,105. 2(tie), Aaron Hagen/Brody Hagen, Benson, Minn., and Mark Nelson, Clitherall, Minn./Lynn Good, Battle Lake, Minn., 1,102. 4, Carol Cooper/Janeen Keywood, Pensacola, Fla., 1,099. 5, Cari Wiest/Larry Wald, Wishek, N.D., 1,091. 6. Dalton Mortenson/Jessica Mortenson, Moorhead, Minn., 1,083. 7(tie), Fannie Patterson, Clymer, N.D./Sarah Plecker, Hummelstown, Pa., and Leilani Basinger/Jonathan Greer, Riverside, Calif., 1,069. 9, Cameron Simmonds, DeGraff, Minn./Allen Jackson, Belle Plaine, Minn., 1,064. 10, Jeff Dale/Corbin Flechsig, Caldwell, Idaho, 1,062. 1, Nick Stenberg, Big Timber, Mont., 621. 2, Michael Tengan, Hilo, Hawaii, 607. 3, Gary Pettway, Sweetwater, Tenn., 598. 4, Melvin Reynolds, North Ridgeville, Ohio, 596. 5, Rory Hanlon, Las Vegas, 592. 6, Efrain Rodriguez, New York, N.Y., 590. 7, James Lee, North Platte, Neb., 589. 8(tie), Gregory Lancaster, Port Orchard, Wash., and Tonja Lindbo, Bremerton, Wash., 587. 10, Maryell Jackson, Bermuda, 585. 1, Nick Stenberg, Big Timber, Mont., 1,733. 2, Gary Pettway, Sweetwater, Tenn., 1,704. 3, Matt Buchholz, Ellensburg, Wash., 1,693. 4, Cody Maier, Spring Creek, Nev., 1,686. 5, Phuoc Tran, West Covina, Calif., 1,661. 6, Tina Wetzel, Elk Grove, Calif., 1,646. 7, Joel Willis, LaPlata, Md., 1,640. 8, Efrain Rodriguez, New York, N.Y., 1,636. 9, Tyler Hagen, Stayton, Ore., 1,633. 10, Nicole Kleutgen, Plainfield, Wis., 1,632. 6-time major champion Kelly Kulick talks about her enjoyment of pizza, movies about great white sharks and dancing in this PWBA profile.